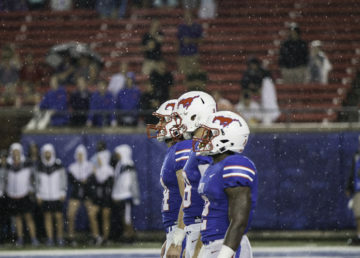 Former President of Mexico, Felipe Calderón Hinojosa, discussed the relationship between Mexico and the United States, immigration, tourism and more at Southern Methodist University March 30. Calderón served as the president of Mexico between 2006 and 2012. The former president was invited to the university by SMU’s AEM chapter, also known as The Association of Mexican Entrepreneurs. 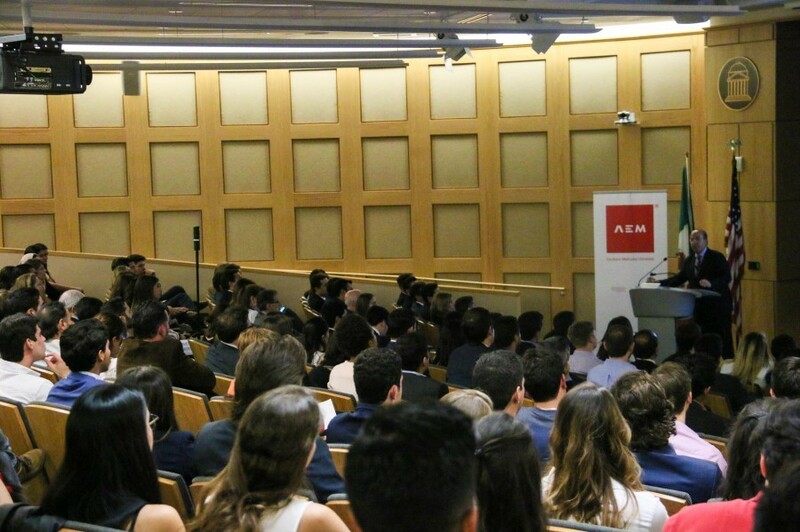 “With the current political atmosphere between the United States and Mexico, it would be almost impossible to not avoid the issues and topics that have risen recently and the problems that have been created,” said AEM President Rodrigo Ricaud during his opening remarks. Calderón began his speech by discussing the relationship between Mexico and the United States. The former President of Mexico pointed out that the United States is just as dependent on his country as well. “What most people don’t know here in the States and even some people in Mexico, is how dependent the United States is on Mexico and how important the relationship with Mexico is for the American people,” he said. Even though both countries rely heavily on one another according to Calderón, he recognized the weakening relationship between both countries. “It’s obvious that we are going through difficult times in our bilateral relationship, probably the worst moment in several decades,” he said. Calderón said that trade between the two countries is extremely important. The agriculture and food industries are the most important for the two countries, he said. Some companies in these industries began to express concerns after hearing President Trump’s campaign promises. Calderón expressed the importance of Mexico and the United States to keep a positive relationship, as the two countries are among the most prosperous and competitive regions in the world. Tourism is also a vital aspect of the relationship between the two countries. “One in four tourists, legal tourists in the United States are Mexicans,” he said. “We the Mexicans love to receive people in Mexico,” Calderón said, including Americans. However, Calderón said that he believes the United States benefits more from the Mexican tourists than vice versa. However, Mexican tourists spend about 4 million dollars more in the United States than American tourists, according to Calderón. 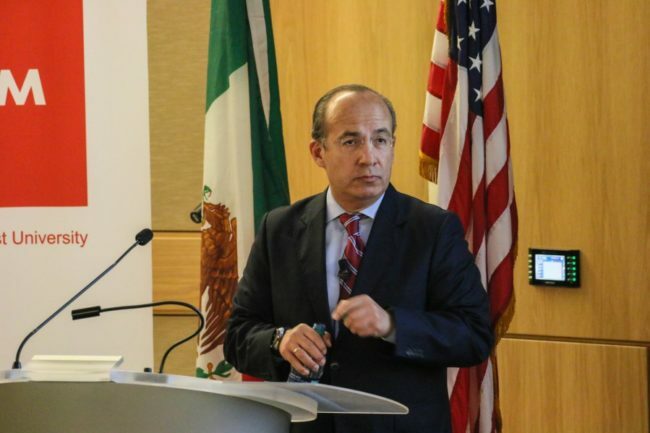 Because of the various advantages that Mexico and the United States gain by having a good relationship, Calderón said that he believed the border between the two should be less restricted. When it came to the topic of jobs in the United States, Calderón asserted that Americans should not be worried about Mexicans taking American jobs. “It’s not true that the Mexican workers are taking the American jobs,” Calderón said. According to Calderón, roughly 87 percent of U.S. jobs lost in the past 60 years was due to automation, while only close to 2 percent moved to Mexico. However, Calderoón did recognize that Mexicans usually take the jobs most American citizens do not. “To serve a plate, to clean the table, to clean up the kitchen, in the kitchen, construction; those jobs are indispensable,” Calderón said. Calderón also touched on an issue that has been a hot topic in the last few years and especially during the recent presidential campaign: immigration. “By tradition and history, last century in particular was a century in which a lot of Mexican workers came to the United States,” Calderón said. One of the reasons for the influx of Mexicans migrating to the United States is the environment in Mexico itself, according to Calderón. “The Mexican government and economy was unable to provide the people with the opportunities that they deserve,” he said. Calderón discussed the wall President Trump promises to build between Mexico and the United States, at Mexico’s expense. Nonetheless, Calderón does not believe in the full proposal of this wall. Mexicans have already begun returning to their country, Calderón said. Calderón also said that one of the reasons for Mexican workers going back to their home country is due to the rise in Mexico’s economy in the last few years. “When I left office, Mexico became the fourth largest exporter of vehicles in the world, and that’s the reason that migration to the U.S. went down,” he said. Calderón said that he believes that a cooperative relationship between the United States and Mexico is important. “Cooperation is fruitful, cooperation is productive, cooperation is positive. If the American government insists to ignore the importance of Mexico, it is very possible that you cannot count on Mexico anymore,” he said. Mexico aided the United States during Hurricane Katrina in 2005. The Mexicans, and in particular, Mexican soldiers have had a lot of experience with natural disasters. And for Calderón, one of the possible solutions to preventing illegal immigration from Mexico is to provide immigrants with incentives. Ultimately, Calderón said that Mexico is not a threat to the United States. Calderón encouraged the relationship between Mexico and the United States during the final moments of his speech.